Background: A small accessory facet with articular surface morphology is occasionally seen on the talus, bordering on the lateral end of the sinus tarsi. This facet has been named the accessory Anterolateral Talar Facet (AALTF). Some investigators suggested the association between smaller angles of Gissane and the presence of the AALTF. The smaller angle of Gissane might be a causative factor of the pain in the lateral part of the hindfoot. However, there were only few anatomical investigations concerning the presence of AALTF and the crucial angle of Gissane. Objective: We report the correlation between the presence of AALTF and the crucial angle of Gissane in feet from the educational bone samples and fixed cadavers. Materials and Methods: A total of 22 paired tali and calcanei from the 11 skeleton samples and total of 22 (11 male and 11 female) adult cadavers were examined. Results: The crucial angle of Gissane was significantly larger in AALTF positive samples than in negative ones of bone samples. However, no significant difference about the crucial angle of Gissane between AALTF positive samples and negative ones could be found in the cadaveric study. Conclusion: Our results using educational bone samples differed from the results of the previous studies. This might come from the factors of age and human race specificity. A well-known reason for the pain in the lateral part of the hindfoot in the flatfoot is talocalcaneal impingement; however, the precise origin of pain has not yet been clarified. A small accessory facet with articular surface morphology is occasionally seen on the talus, bordering on the postero-lateral end of the sinus tarsi which is the main location where symptoms of talocalcaneal impingement occur . This facet was first described by Sewell in 1904 and has been named the accessory Anterolateral Talar Facet (AALTF) . Recently, we found some reports that the AALTF might represent a new etiology for the lateral pain in the flatfoot [3-5]. Some investigators suggested the association between smaller angles of Gissane and the presence of the AALTF. And the smaller angle of Gissane might be a causative factor of the pain in the lateral part of the hindfoot [3,6]. However, there were only a few anatomical investigations concerning the relationship between the presence of the AALTF and the variation of measured angles within the talocalcaneal joints including the crucial angle of Gissane. This lack hampers clinical decision making in patients with related symptoms of painful talocalcaneal impingement in the flatfoot. To understand the reason for the pain originating from the sinus tarsi its precise morphology needs to be studied. In the present study, we report the precise morphometry for the presence of AALTFs with emphasis on the anatomical correlation between the presence of this facet and the crucial angle of Gissane in feet from the educational bone samples and fixed cadavers. The present study by using cadavers was conducted within the parameters of the written permissions we received from the donors and their surviving relatives and the present work conformed to the provisions of the Declaration of Helsinki in 1995 (as revised in Edinburgh in 2000). This study by using the educational bone samples and fixed cadavers was approved by the institutional review board of Nagoya City University Graduate School of Medical Sciences according to the ethical guidelines for epidemiology research (Approved Number 60-18-0010). For the study of educational bone samples, a total of 22 paired tali and calcanei from the 11 skeleton samples from individuals were examined (Table 1). These bone sets have been used for the medical students’ education over 50 years at Nagoya City University Graduate School of Medical Sciences. The gender and the age of them are all unknown. We speculated that almost all of them might be relatively young at the time of death because 4 of 11 bone sets showed the open iliac apophysis and the other bone samples also seemed to have almost the same physique. All of them seem to be women from the characteristics of the pelvis. For the cadaveric study, a total of 24 (12 male and 12 female) adult cadavers with no known pathological conditions in the talocalcaneal joints were examined during educational dissection at Nagoya City University Medical School in 2018. The average age at death was 80.4 years old (69~91) in male and 86.5 years old (67~99) in the female. Because of the poor condition of the talus, analyzable data could not be obtained from 2 cases. After exclusion of these 2 cases, 44 talus (22 right and 22 left) were analyzed (Table 2). All of the cadavers had been perfused by using fixative through the femoral artery and preserved in a natural posture in the usual manner. We transected and reflected the skin, ligaments and soft tissues to study the presence or absence of an AALTF. After detailed dissections of the lateral surface of each talus to make it completely visible, the morphometric measurements were taken. As shown in Fig. 1, the maximum anterior-posterior width of the AALTF was measured by using a vernier caliper (KSM-15FF, Nakamura Mfg. Co., Ltd, Tokyo, Japan) and we judged the talus as positive when this measurement was exceeded 5mm (Fig. 1). We also measured the crucial angle of Gissane by using an orthopedic protractor (Fig. 2). Statistical analyses on the point of laterality, gender difference and the difference in the crucial angle of Gissane in calcanei with or without the AALTFs were obtained by using Student’s t-test method. All measurements of each specimen were made by a single investigator (Y.K.). The AALTF could be identified when there was an anteriorly directed prominence of the lateral talar process with a surface appearance similar in character to other talar articulations. The AALTF appeared somewhat triangular in shape and could be easily distinguished from the regular talus. 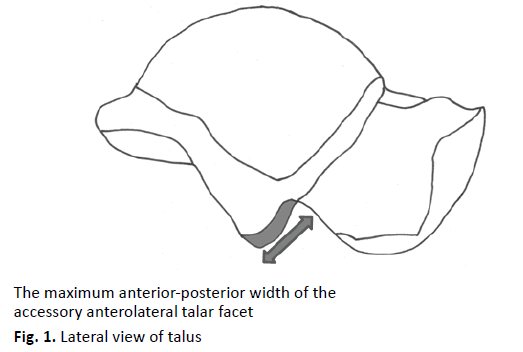 The AALTF being situated at the junction of the lateral surface of the corpus with the posterior wall of the sinus tarsi, in front and somewhat to the outer side of the lateral process of the talus. Articular cartilage was always observed on the accessory facet and the cartilage surface also faced forwards and slightly outwards. In this investigation, an AALTF was identified in 4 (18%) of the 22 specimens of educational bone samples and in 13 (30%) of the 44 specimens of cadavers. In bone samples, 2 displayed the facet bilaterally of 11 paired tali and calcanei samples. Of the 22 cadavers with paired talar specimens, 6 displayed the facet bilaterally, while 1 displayed it only in the right side. There was no significant difference (p>0.05) in the angles of Gissane measured in right and left legs in either bone samples (Rt: 121.4 degree compared with Lt: 118.2; p>0.05) or cadavers (Rt: 113.1 degree compared with Lt: 113.5; p>0.05) (Table 1 and 2). Also, we found no significant difference (p>0.05) in the crucial angle of Gissane between the male and female donors (Male: 114.7 degrees compared with Female: 111.9; p>0.05) in the cadaveric study (Table 2). The crucial angle of Gissane was significantly larger in AALTF positive samples than in negative ones of educational bone samples (Graph 1). However, no significant difference about the crucial angle of Gissane between AALTF positive samples and negative ones could be found in the cadaveric study (Graph 2). The subtalar joint has been known to be a complex articulation. It is known that the sinus tarsi opens in inversion and closes in eversion [7,8]. The tibia and talus internally rotate during the first half of the stance phase of the gait cycle, and the subtalar joint complex everts leading the foot to become unlocked. During the latter part of the stance phase, the tibia and talus externally rotate, therefore the subtalar joint complex inverts and the talus dorsiflexes, resulting in the entire foot being locked [9,10]. Subtalar eversion is produced by the calcaneal movement in extension, pronation, and abduction of the ankle joint and foot while the talus moves in flexion, supination, and adduction. The sinus tarsi close by subtalar eversion because the talus and calcaneus move in opposite directions to generate the everted hindfoot position . 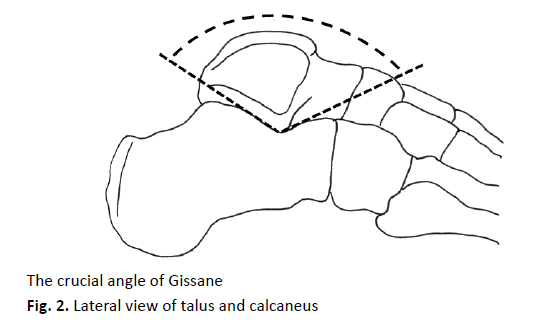 It should be noted that the narrow-angle of Gissane might induce more constraint of the talar head and produce the limited medial rotation of the talus on the time of heel strike during the walking phase. And this produces excessive narrowing state of the sinus tarsi and might cause the inflammation with pain in the lateral part of the hindfoot . There have been some investigations concerning about the relationship between the crucial angle of Gissane and the presence of the AALTF [3,6,13]. Martus and co-workers surveyed the pediatric bone samples within the Hamann-Todd Human Osteological Collection at the Cleveland Museum of Natural History and studied the 79 paired tali and calcanei from the 43 skeletons from individuals who had an average age of 13.4 years (from 3 to 18 years old) at the time of death. In their investigations, an AALTF was identified in 27 (34%) of the 79 specimens. The skeleton samples with an AALTF had a significantly smaller mean angle of Gissane in comparison with those without an AALTF (116.2 degrees compared with 122.2; p=0.018) . Aydıngöz and co-workers performed the case-control study by using the ankle Magnetic Resonance Imaging (MRI) of persons with and those without ankle pain. The results showed that the AALTF is present on MR images of approximately one-third of ankles with ankle pain and one-fourth of ankles without symptoms. And the angle of Gissane was significantly smaller in persons with an AALTF, either with or without symptoms (p<0.0001) . In Japan, Hirano and co-workers performed the study to examine the anatomical features of the AALTF of the talus and the opposing calcaneus in aged cadavers (86.5 years old at death: range 70- 102 years). They reported no significant difference in the angle of Gissane between with and without the AALTF in 44 feet obtained from 22 cadavers . Our findings using cadavers were similar to those of Hirano and co-workers in that there was no difference between the angle of Gissane and the presence of an AALTF. However, our results using educational bone samples differed from the results of the studies by Martus, Aydıngöz, Hirano, and co-workers. The disparities among the studies including the present study concerning the presence of AALTF and the crucial angle of Gissane in feet might reflect the age and racial differences of samples. Boyle and co-workers reported that, the mean crucial angle of Gissane was 111.3 degrees (range 90.1 to 147 degrees) in the paediatric study group (0~14 years of age), while the mean angle was 113.8 degrees (range 97.1 to 132 degrees) in the adult group (30~70 years of age) and the difference in this angle between these two groups was statistically significant. They suggested that the crucial angle of Gissane might change during the growth of children to adults that might come from the significant changes in the bone structure during the young age . Sengodan and co-workers studied to determine the normal ranges of the calcaneal parameters in the Indian population and compared the results with the previous data found in the literature. They reported that the mean crucial angle of Gissane in their investigations of the Indian population is 126.79 degrees, whereas, in the western population, it is 122.5 degrees in the literature. The difference between the western and Indian value in this angle is statistically significant (P<0.05) . Non-invasive imaging techniques, such as Computed Tomography (CT) or MRI, have made it possible to demonstrate anatomical definition including abnormalities which have been difficult to detect. In the orthopedic assessment around the sinus tarsi including the presence of AALTF and measurement of the crucial angle of Gissane, cross-sectional imaging such as CT with coronal and sagittal reconstructions might be useful for morphological identification. MRI could be a great help in demonstrating the evidence of impingement through localized edema of bone marrow around the sinus tarsi. The possibility of an AALTF and the narrow-angle of Gissane should always be kept in mind during the clinical diagnoses of lateral foot pain in talocalcaneal impingement presenting with the flatfoot. We report the anatomical correlation between the presence of AALTFs and the crucial angle of Gissane in feet from the educational bone samples and fixed cadavers. 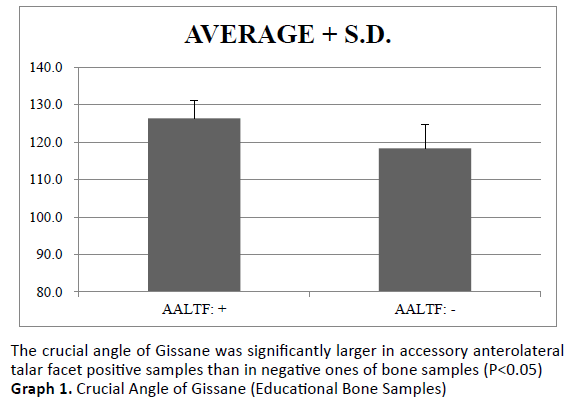 The crucial angle of Gissane was significantly larger in AALTF positive samples than in negative ones of educational bone samples. 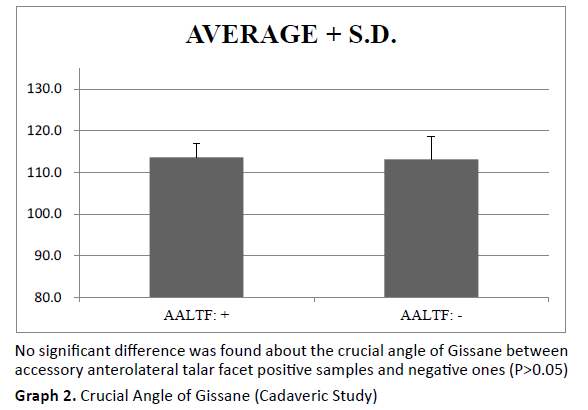 No significant difference about the crucial angle of Gissane between AALTF positive samples and negative ones could be found in the cadaveric samples. None of the authors have any conflicts of interest or disclosures in relation to this work. Hattori K., Sakuma E., Nakayama M., et al. : An anatomic study of the accessory anterolateral talar facet. Folia Morphol (Warsz). 2015;74(1):61-64. Sewell R.: A Study of the Astralagus. Part II. J Anat Physiol. 1904;38 (Pt 4): 423-432. AydÄ±ngÃ¶z Ã., Melih TopcuoÄlu O., GÃ¶rmez A., et al. : Accessory anterolateral talar facet in populations with and] without symptoms: prevalence and relevant associated ankle mri findings. AJR Am J Roentgenol. 2016;207(4):846-851. Neumann J.A., Mannava S., Gross C.E., et al. : Arthroscopic debridement of pediatric accessory anterolateral talar facet causing impingement. arthrosc tech. 2016;5(2):e413-417. Kurashige T.: Accessory anterolateral talar facet impingement with tibialis spastic varus foot. SAGE Open Med Case Rep. 2017; 5:2050313X17745210. Martus J.E., Femino J.E., Caird M.S., et al. : Accessory anterolateral facet of pediatric talus. Anatomical study. J Bone Joint Surg Am. 2008;90(11): 2452-2459. Knudson G.A., Kitaoka H.B., Lu C.L., et al. : Subtalar joint stability. Talocalcaneal interosseous ligament function studied in cadaver specimens. Acta Orthop Scand. 1997;68(5):442-446. Ozeki S., Kitaoka H., Uchiyama E., et al. : Ankle ligament tensile forces at the end points of passive circumferential rotating motion of the ankle and subtalar joint complex. Foot Ankle Int. 2006;27(11):965-969. Elftman H.: The transverse tarsal joint and its control. Clin Orthop. 1960;16:41-46. Mann RA. : Biomechanical of the foot. In: American Academy of Orthopaedic Surgeon, editor. Atlas of Orthotics. St. Louis, USA: C.V. Mosby Co. 1975:112-125. Sarrafian S.K. : Biomechanics of the subtalar joint complex. Clin Orthop Relat Res. 1993;290:17-26. Drayer-Verhagen F.: Arthritis of the subtalar joint associated with sustentaculum tali facet configuration. J Anat. 1993;183(Pt 3):631-634. Hirano T., Niki H., Akiyama Y., et al. : Anatomical characteristics of the accessory antero-lateral talar facet. J Orthop Sci. 2015;20(1):124-128. Boyle M.J., Walker C.G., Crawford H.A. : The paediatric Bohler's angle and crucial angle of Gissane: a case series. J Orthop Surg Res. 2011;6:2. Sengodan V.C., Amruth K.H., Karthikeyan. : Bohler's and Gissane Angles in the Indian Population. J Clin Imaging Sci. 2012;2:77.